Preheat the oven to 350°F. Remove the silverskin (the silvery-white connective tissue running along the top) from the pork tenderloin with a sharp knife. Pat the tenderloin dry with paper towels and set aside. Combine the brown sugar, salt, paprika, and cayenne in a small bowl. Rub all of the mixture into the pork tenderloin. 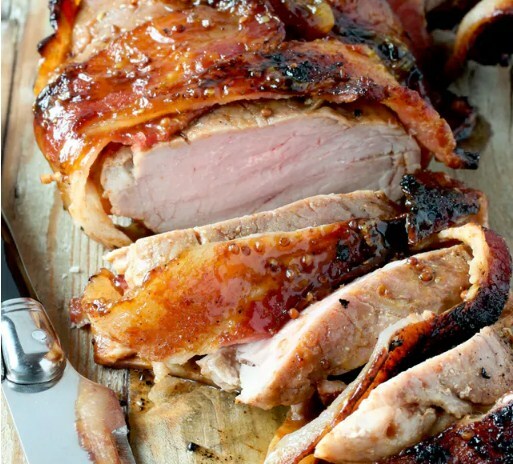 Wrap the tenderloin with the strips of bacon, securing along the sides with toothpicks. Heat the canola oil in a large cast iron skillet, or other oven-proof skillet, over medium-high heat until sizzling. Add the bacon-wrapped tenderloin and sear — do not disturb it while it’s searing — until deep caramel brown, about 6 to 8 minutes. Flip the tenderloin and continue searing until the other side is browned. Mix the chutney and mustard in a small bowl and brush generously over the top of the tenderloin. Transfer the skillet to the oven and cook the tenderloin until a probe thermometer reads 140°F, approximately 10 to 14 minutes. You can find Major Grey’s Chutney at most grocery stores, or purchase it online. You can also substitute another favorite chutney or jam.